We were inspired to write this article due to some experiences that each author had encountered in their own personal lives. In some situations, we found ourselves thinking about what work must be like for people we met in our daily lives, how they might be treated as an employee, and how their co-workers and leaders were experienced. I personally had a profound experience while traveling aboard, watching a man dig hundreds of small square holes in the blazing sun, with no break or water in long sleeves. Despite the conditions outside and what seemed to be the grueling nature of his work, he was smiling and seemed to be enjoying his duties. He moved from hole to hole with energy and presence, paying close attention to the details of the earth he was moving. I wondered if it were possible for this man to be engaged when the conditions of his work seemed so tough. After some reflection, I realized that I needed to check my own privilege, realizing that I had a lot to learn about deconstructing issues related to privilege – and inherently power – when it came to exploring the idea of employee engagement. It was of course entirely possible for the man I met to be engaged – and for any person to be fully engaged in any work – and that so much of what I was assuming about his work – and again, the work of others – was wrapped in the ways individuals encountered experiences of privilege in their own work settings. It became important for us to explore these issues, as we suspected that both privilege and power potentially influenced experiences of engagement, although we knew very little about how and why this might happen. We were initially struck by the fact that almost universally, every organization wants higher levels of engagement, and despite decades worth of research and practice, the numbers on engagement have changed very little. Some have suggested that this is due in large part of the failure to win the hearts and minds of employees. We offer, however, that perhaps it is not a massive failure at all; rather for the many who go to work every day, organizational struggle is the norm due to encounters of privilege at play inside organizations. When employee engagement is a privilege only a select few employee’s experience, we agreed with scholars such as David Guest – who suggested that employee engagement is nothing more than a manufactured, normative, and exploitative overextension of work (our words, not his). On the other hand, when organizations develop deeply inclusive cultures that foster engagement – when they support the conditions for engagement to flourish and all employees enjoy a positive psychological state of work—this leads to higher levels of performance, greater productivity, and experiences of higher levels of well-being. Because we define employee engagement as a psychological state dependent on an employees’ encounters with that organizational culture, the outcomes of employee engagement (i.e., higher performance) can be defined as a privilege for the organization. When an organization nurtures those conditions of engagement, employees are more likely to engage at higher levels and consequently perform better. Undoubtedly, higher levels of performance becomes an earned organizational asset that helps an organization advance and benefit over and at the expense of their competitors. The willingness to nurture the conditions for engagement develops as an authentic experience for the employee. From this perspective, employee engagement is not exploitative or overextending at all. It is transformational and positive, and it is a shared experience. There is still so much to unpack and work through with this topic, and we hope that our work can inspire future research that might take up this perspective empirically, to test our propositions and better refine this still emerging theory. We also hope that those who read our ideas on this topic will think about their own engagement and how, if at all, their experiences with their own work have been influenced by encounters with privileged organizational structures and individuals, as well as what role they choose to play in that process and experience. The purpose of our work was to explore the job demands–resources model of engagement through the critical lens(es) of privilege and power. This deconstruction of the privilege and power of employee engagement was focused toward exploring four principal questions: Who (a) controls the context of work? (b) determines the experience of engagement? (c) defines the value of engagement? and (d) benefits from high levels of engagement? We conclude that organizations and employees both benefit from the outcomes associated with the heightened experience of employee engagement. We maintain, however, that the organization is uniquely positioned to influence systems of power and privilege that ultimately enable the conditions for engagement to flourish. Organizations desiring high levels of engagement have an obligation to confront manifestations of privilege such as unequal states of power, access, status, credibility, and normality. 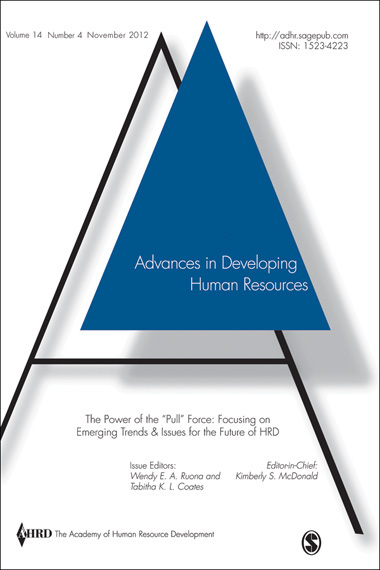 You can read “Deconstructing the Privilege and Power of Employee Engagement: Issues of Inequality for Management and Human Resource Development“ from Human Resource Development Review free for the next two weeks by clicking here. Want to stay current on all of the latest research from Human Resource Development Review? Click here to sign up for e-alerts! We find the negative focus on organizational stress disturbing. Stress is a normal and oftentimes positive part of life within any organization. In this article we attempt to help HR professionals harness the positive possibilities of workplace stress. We also offer a theoretical framework for researchers to explore. We introduce a new phrase–“positive HRD”–that seeks to promote positive organizations by developing opportunities to challenge employees. We provide a theoretical framework to explore the possibilities of positive organizational stress. HR and HRD professionals will find this article helpful in two ways: (1) we provide a theoretical explanation for the efficacy of existing HR practices, and (2) we point out specific interventions that can help create improved performance, improved worker well-being, and other important positive organizational and individual outcomes. Building on existing conceptualizations of stress, we present a model that provides an alternate explanation of the efficacy of human resource development (HRD) interventions. Unlike most stress research that emphasizes the negative side of stress, we view eustress—good stress—as a positive individual and organizational outcome. The HRD eustress model extends theory from the positive psychology and positive organizational behavior literature and positions a role for HRD in creating positive stress as a means to improve performance. We describe how HRD professionals can help challenge employees as a means of attaining individual goals and personal development. You can read “The HR Eustress Model: Creating Work Challenge Through Positive Stress” from Human Resource Development Review free for the next two weeks by clicking here. Want to know all about the latest research from Human Resource Development Review? Click here to sign up for e-alerts! M. Blake Hargrove is associate professor of Management in the John L. Grove College of Business at Shippensburg University. His research interests include positive organizational behavior, scale development, and applied business ethics. He holds a PhD from the University of Texas at Arlington. Wendy S. Becker is professor of Management, Shippensburg University. Research interests include experiential learning and the efficacy of workplace interventions, as well as managerial development and motivation theory. She received the Award for Innovative Excellence in Teaching, Learning, and Technology from the International Conference on College Teaching and Learning and she is a Fellow of the Society for Industrial and Organizational Psychology. Debra F. Hargrove is associate vice president for Human Resources Services at Dickinson College. She has dedicated her career to make the organizations in which she serves better places for all employees. She has been an HR practitioner for more than twenty years, holds an MA in Human Resources, and earned the Senior Professional in Human Resources (SPHR) designation. Introducing Human Resource Development Review’s New Editor! Julia Storberg-Walker is Associate Professor of Human and Organizational Learning at the George Washington University’s Graduate School of Education and Human Development. After spending 13 years in various roles at Deloitte & Touche, LLP and Deloitte Consulting, she earned her PhD in Human Resource Development from the University of Minnesota in 2004. Since that time she served at North Carolina State University, first as an Assistant then an Associate Professor in NC State’s College of Education. 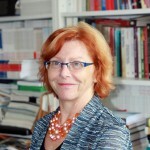 She’s a recognized scholar of theory building research, and has published and presented globally on theoretical and conceptual development for applied disciplines. She adopts a critical lens and incorporates a variety of qualitative research strategies to her work. She is also the recipient of multiple awards, including the Early Career Scholar Award (2011) from the Academy of Human Resource Development (AHRD), the Outstanding Extension Service Award Winner (2012) from NC State, and the Global Innovation Award for Excellence-Corporate Category (2013) from the World Institute for Action Learning (WIAL). Julia is the current Editor-in-Chief of Human Resource Development Review, and has served in a variety of academic and professional leadership positions including Senior Vice President of the Academy of Human Resource Development; Faculty Chairperson of NC State’s College of Education, Co-Host of the 2014 Advancing Theories of Women and Leadership Colloquium, and the International Leadership Association’s Women and Leadership Affinity Group’s Executive Leadership Team. While at NC State, she brought in over $1 million dollars in funded projects as PI or Co-PI, served on a number of University committees, and consulted with a diverse array of organizations including the Office of Violence Against Women, the JFK School of Special Warfare at Fort Bragg, and North Carolina Administrative Office of the Courts. Her current research is focused on the intersection between leadership, gender, and social entrepreneurship/social change. She is particularly interested in developing new leadership theories for women, and examining the role of social entrepreneurship on political engagement, sustainability, and enhancing social and economic equality. Human Resource Development Review is a theory journal for scholars of human resource development and related disciplines. The journal publishes articles that make theoretical contributions to theory development, foundations of Human Resource Development, theory building methods, and integrative reviews of the literature, as well as addressing philosophies of Human Resource Development, historical foundations, definitions of the field, conceptual organization of the field, and ethical foundations. 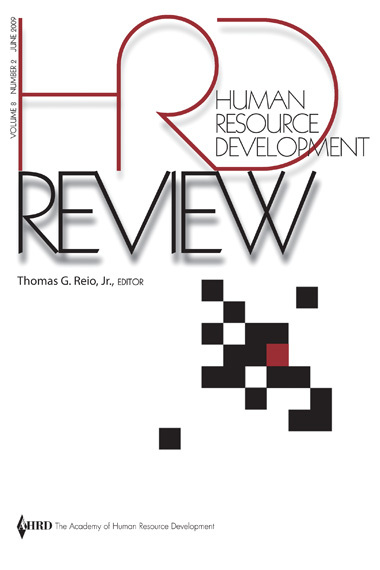 The September issue of Human Resource Development Review can be read for free for the next 14 days and can be found by clicking here. Want to know about all the latest news and research from Human Resource Development Review? Click here to sign up for e-alerts! I was inspired to research the topic spurred by curiosity as to why the academic and practitioner literatures appeared to focus extensively on understanding successful Lean experiences. The literature appeared to neglect studying implementation failures which I believe has much to offer in terms of expanding our current knowledge and understanding of why so many organizations discontinue Lean strategy implementation. I began to target action research based literature where scholars elaborated on Lean implementation experiences of organizations – the good, bad and anything in between. This was an important research goal and expectation for the study. I was able to cull out 57 articles drawing from the contributions of many disciplines such as general management, operations and production management literatures reporting Lean implementation success and failures. Even though the literature reporting Lean implementation failures were by far fewer, I was able to identify a set of factors that enable (e.g. management commitment, internal and external partnerships) or hinder (e.g. lack of crucial knowledge, exclusion of key stakeholders) organizations from experiencing success in Lean implementation. Some factors by their presence or absence appeared to share hindering or facilitating characteristics in different studies. These factors were grouped separately to highlight the need for considering the contextual challenges and opportunities specific to the organizations which influence Lean outcomes. For example, even though knowledge of Lean tools was identified as a supporting factor, their incorrect application based on mistaken assumptions about quality, cost, and delivery negatively affected customer value. This finding was critical as it sharpened the research to further study the impact of these factors on different levels of the organization – individual, team, organization. Most factors were classified using this additional lens. However, a few factors such as market position, nature of industry and customers etc appeared to have an even deeper impact. These were categorized as having the maximum effect at the systems level. As in the above mentioned example, the lack of crucial knowledge (incorrect application of Lean) had a powerful impact on employee performance, as well as on team, process and ultimately, undermining customer value. The four-level classification scheme was helpful in developing a conceptual model for framing organizations as learning-performance systems to emphasize the aspects of learning and performance that simultaneously take place during Lean implementation. From this standpoint, the simultaneous focus on performance and learning incorporates reflection in and on action, and presents a dynamic perspective for understanding the “nuts and bolts” of Lean implementation which is essential for success. In terms of future research, the conceptual model calls for recognizing the development and implementation phases of Lean strategy as distinct. Further the model suggests adopting different approaches for eliciting leadership commitment (formal and informal) and involvement of teams (e.g., departments, divisions, shop floor teams) with respect to resource allocation and distribution so that the overall organizational performance needs are integrated and addressed as interdependent rather than what is typically portrayed in the literature as independent and mutually exclusive. Such an approach to Lean that typically privileges the efficiencies of performance and takes for granted the dynamics of learning and its demands would a valuable contribution to the literature. In terms of practice, the conceptual model serves as a dashboard for assessing what Lean initiatives are currently in place, the individuals or departments responsible for implementing those initiatives, the impact of the interventions on areas (or levels) the organization hopes to remedy or improve, determine responsibilities and goals, identify resources, and potential barriers. Thus, an integrated sequence of change efforts enabling systemic improvements can be introduced in organizations for increasing success in Lean. Read the entire article online in Human Resource Development Review, and sign up for e-alerts here so you don’t miss out on HRD’s latest articles and issues.